The Jazz Band performs at a Homecoming concert. 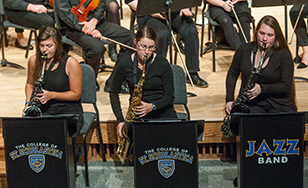 St. Scholastica's Concert and Jazz Bands will perform their "Pops Concerto" concert at at 2 p.m. Sunday, April 29 in the Mitchell Auditorium. Tickets are $5. The performance will feature a commissioned piece titled "Evening Prayer" by Andrew Boysen to honor Sister Monica Laughlin, a longtime music faculty member at St. Scholastica and Benedictine Sister at St. Scholastica Monastery who died in 2014. Boysen is a professor in the music department at the University of New Hampshire and a busy composer, receiving commissions from festival, university, and high school concert bands across the United States. "Evening Prayer" "is intentionally reflecting both the legacy and the musical gifts that Sister Monica gave to the music department and the College," said band director Dr. Michael Buck. The song features an educational aspect in that the hymn it was based off of was used to teach solfege, a method for learning pitch and sight singing. In addition, "Evening Prayer" commemorates the 125th anniversary of St. Scholastica Monastery. Graduating seniors will be highlighted in the concert, particularly Micheal Moxley, who will perform a tuba concerto. Listeners can expect a wide variety of music, including ballads, swing tunes, funk, and a gospel piece Buck composed himself. The band will also perform the popular Irish folk song "Danny Boy" in both its traditional version as well as a more contemporary interpretation. This is Concert Band's last performance of the season. Jazz Band will perform again at commencement.